A long known archaeological site, that of one of the largest Roman Villa rustica sites in the Saar-Moselle area, was time and time again being damaged by illegal looting excavations. That is why in 1986, official excavations started, supported by the Landkreis Merzig-Wadern. 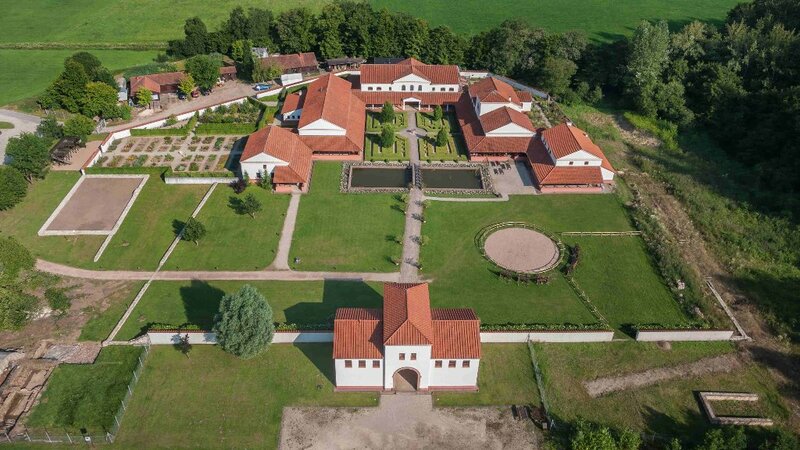 After more than 20 years of excavations and reconstructions, the Archaeological Park Roman Villa Borg has become one of the greatest attractions of our region. The entire complex gives the visitors a good impression of the different aspects of rural Roman life. The complex is one of a kind in Europe. Efforts were taken to resemble the classic architecture of the buildings as closely as possible, and gardens were landscaped to round off the overall impression. The manor accommodates a museum that takes us from the Stone Age to the Romans through all periods of which evidence was found in and around Borg. Excavations are still in progress, and the findings they bring are changing the appearance of the complex all the time. We are hoping for future opportunities to add more buildings (especially for experimental archaeology) to the total complex, maybe we can even make the entire complex with the master and economy sections open to the public. Since August 1, 1986 approximately two hectares of the settlement site had been dedicated, fenced in, and prepared for the excavations. Soon after the first ground sections were uncovered, the question was how to secure the archeological finds. After many discussions, with expert scientists from Germany and abroad, in 1994 the far-reaching decision was made not only to excavate the entire villa complex, but to reconstruct it according to scientific principles, and to refill it with life. All involved stakeholders were aware that this project – as any other archeological reconstruction – could not be a reconstruction true to the original and to the details, but would be a model influenced by hypotheses, which should represent and realize different options. At the same time, all information that had been and would still be gained from the excavation was to be considered in the constructions to be made on the classic ground section. The modern buildings are set on the classic foundations. It is the construction status as at the transition from the 2nd to the 3rd century AD. The villa bath with the tavern – the first section – was completed in 1997. The manor was handed over to the public in May 1999. In the manor, a small museum was set-up with select finds from the Villa Borg complex and from the vicinity. The third wing of the complex, which had been used for residence and for economy purposes in the classic period, was completed in 2001. The portal section between the manor and the economy yard were handed over to purpose in 2004, the Roman kitchen in 2008. The villa bath as well as the Roman kitchen were reconstructed in working order and were used for events (e.g. 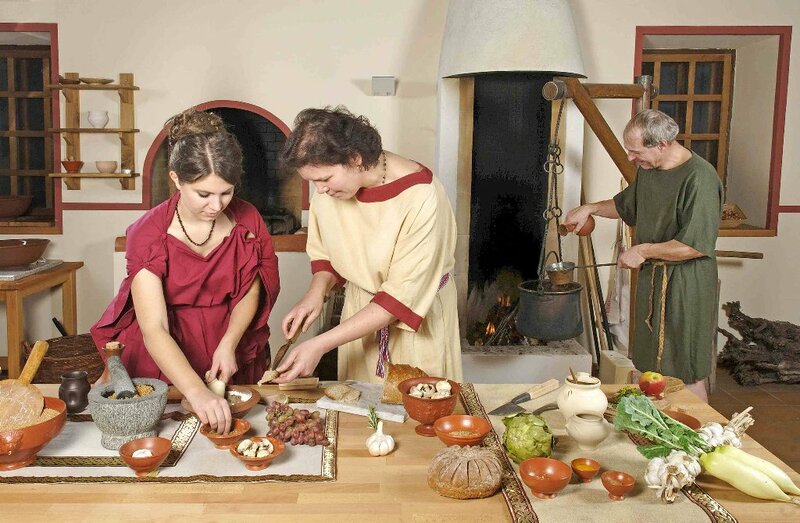 "Cooking like the Romans") Exhibitions and events on different subjects are offered throughout the year. Kids’ projects take place regularly. Several times a year, archeological lectures intensify special topics. Since 2011 the International Re-enactment Market is one of the annual highlights; another one are the "Roman days" in August. At the moment we are planning different projects regarding experimental archaeology.